Wendy Lyn Phillips is a natural born ringleader that inspires others to achieve personal and professional excellence. 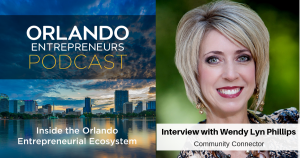 As a Maestro with 30 years as a business owner, she shares her business acumen for strategic development with organizations and leaders that want to be intentional about how they execute initiatives and programs. She has been a part of numerous start-ups and has owned 5 companies including Wendy Lyn Unlimited; a company providing coaching services for individuals and teams that want to improve their brand identity, but most of her time now is devoted to providing a mobile platform for more streamlined marketing and communications to organizations that host events. As a national speaker, best selling author, and TV Host, Wendy is most excited about her newest venture and partnership as President of Community Event Apps – a mobile technology business platform that promotes engagement, marketing support, and connections – making the attendee experience a more meaningful one. Her new role with CEA is proof that there is power in leveraging relationships. Her prior role in philanthropy allowed her to make the meaningful connections for this new opportunity in the tech space. She currently sits on the board at NAWBO Orlando as their Immediate Past President as well as on the national committee. She loves her rose and herb garden. She is a mom of a teen and tween, husband to Glenn for 24 yrs and helps him run their custom home building business, and has been a true entrepreneur for at least 40 yrs. In her down time, she enjoys cooking, traveling & shopping. Excellent interview! Wendy Lyn Phillips can convey her passion and enthusiasm like no other!